Yo, dawg! We heard you liked camber so we cambered your camber and stanced your vintage Hot Wheels. You dig? I don’t really consider myself a Hot Wheels collector, at least not a serious one. I had some when I was a kid, got interested again when I was a high school freshman (who never got laid), and again when I needed something to decorate my office cube earlier this year. Most of my office collection is Corvette centric, though I have some great Ferraris too. Since I’m also an F1 fan, I’m a little disappointed that Hot Wheels hasn’t produced a quality 1:64 F1 car in quite some time. Sure there’s the F1 Racer (that has a high nose and never licensed livery), but nothing has ever matched the Grand Prix series of redlines from 1969. That’s why I picked up this trio of cars off eBay last week. 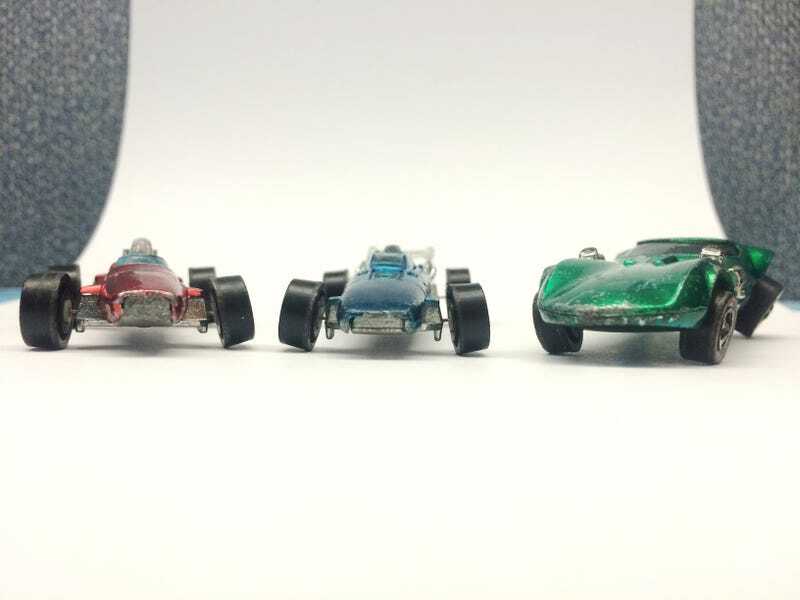 I finally have some great open-wheel cars for my collection. Well… sort of great. Obviously all three cars have experienced life beyond the blister pack. But what disappointment I might have in their quality (and considering I got all three for $14 shipped, I’m not complaining), I take joy in the fact that they were loved. This is probably the best of the lot, relatively speaking. As is the case with all the cars, the axles are bent. The front wheels have negative camber, the back wheels have positive camber, and on a flat surface, the front right wheel doesn’t touch. The top of the windscreen is well-worn but I’m pretty happy that the plastic exhaust/wing are still attached, which is more than I can say for one of the other cars. I didn’t understand the fascination with Spectraflame paint until I got these cars. It’s hard to capture in a cell phone photo the way the paint shines. The Eagle appears to be the aqua blue variety it has some uneven dark splotches and some chips here and there but overall I’d say it still looks pretty good for a 46-year-old toy. This was the car I really wanted when I started shopping for Redlines because I’m a bit of a Dan Gurney fan. The Eagle-Weslake that he raced in F1 in 1967 is probably my favorite race car of all time. The Brabham has seen some rough days. The exhaust is broken off and missing, the windscreen is scratched across the top and smashed in a bit in one spot, and all four wheels are bent in and up slightly. Aside from some chips (like the Eagle), the red Spectraflame paint still has a fantastic shine. Apparently some of the original waterslide decals also made it onto the Brabham and have held out all these years. There’s a Fram decal on each side of the engine housing and a Bell decal on each side of the nose. Overall the car could be better but again, considering what I paid, I’m happy to add it to my office lineup. Have I mentioned how great this Spectraflame paint looks after 46 years, part of which probably was spent in several children’s hands? Of the three, I was least interested in the Twin Mill. The axles are so bent that the car almost looks like a bulldog getting ready to pounce, but the green paint (again, aside from some chips) looks great. If this gets reposted on LALD, I don’t have much interest in keeping the Twin Mill and would like to trade it if anybody is interested. Maybe it’d make a good project... or you’re like me and just having an original Redline is cool. Otherwise it might end up on eBay. Also, I’d really like authorship on LALD so I could post stuff like this there occasionally.